Many women make the decision to go natural but have no interest in cutting all of their hair off, also known as the big chop. 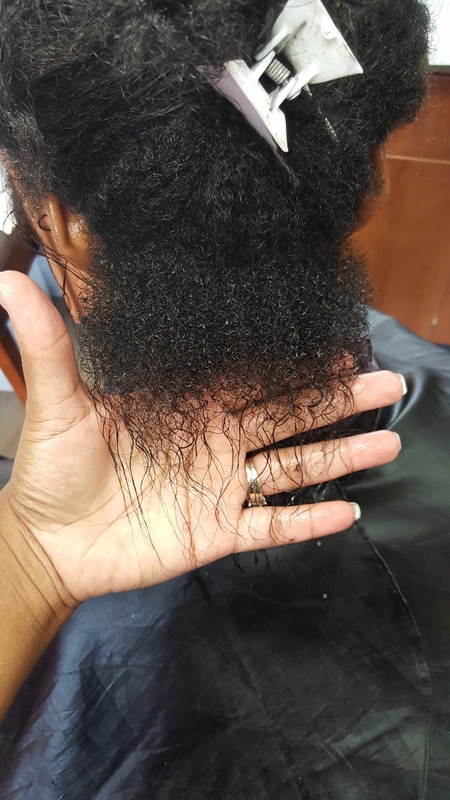 These women are choosing to transition from having relaxed hair to having natural hair. 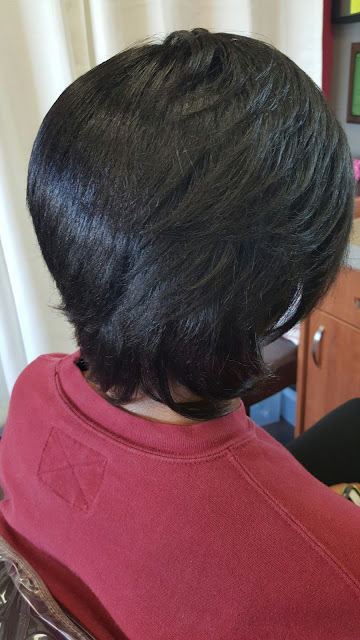 This client of mine has been transitioning for about a year and was having mixed emotions about chopping the rest of the relaxed ends off. She wanted to cut it off but did not want her hair to be too short to put into a ponytail. But, as you can see in the picture below, cutting her relaxed ends would make her hair way too short to put into a ponytail. So, she had a decision to make. Should she go ahead and cut the relaxed ends off of her transitioning hair or should she hold out a little longer? I suggested that she should go ahead and cut the rest of the relaxed ends off and here is why. 1. 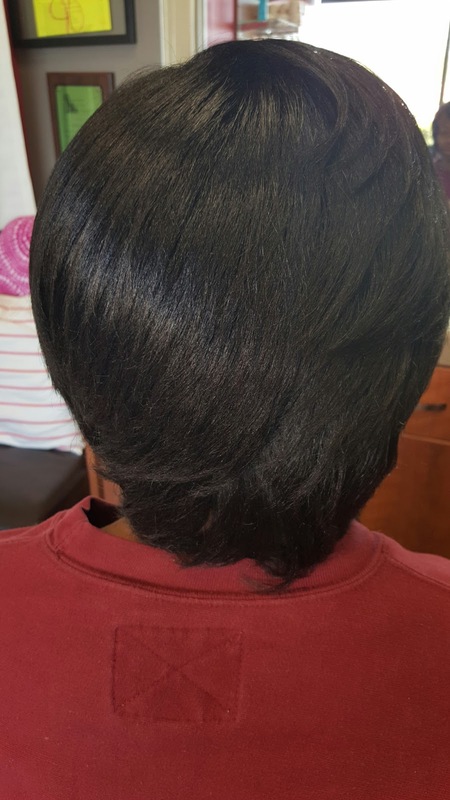 The hair looks healthier- Especially if the relaxed hair you have is damaged, you can clearly see a difference between the natural hair and the relaxed hair. The natural hair looks much healthier, is thicker, and fuller while the relaxed ends often look jagged, thin, and frayed. Although the relaxed ends give you more length, cutting them will make all of your hair look healthy from root to end which is the ultimate goal. You will get more length as time goes on but you never want to sacrifice healthy hair for length. 2. It is easier- Dealing with two textures can be very tough for some natural women. If your roots or the first four to six inches of your hair are natural and you have another two or so inches of relaxed ends you more than likely have a hard time doing certain styles. 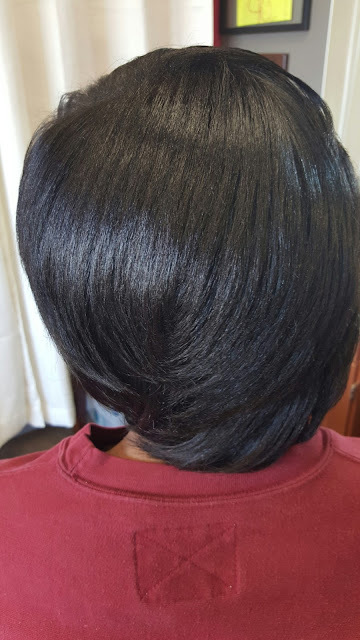 Some of the natural styles that you want to try will not look right with straight, relaxed ends, And if you have more than two inches or so of natural hair then it is also hard to do any relaxed hairstyles with the natural part of your hair. 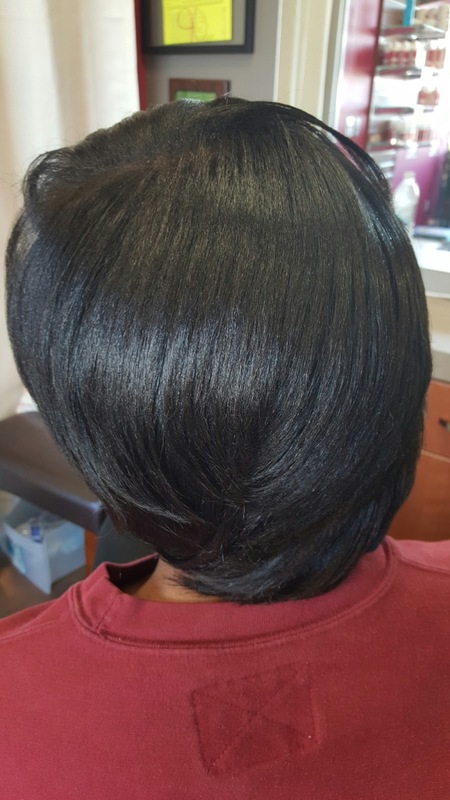 It is better to just go ahead and cut the relaxed ends off of your transitioning hair so that you will only have to deal with one texture. 3. Because it is time!- If you have been transitioning for at least one year, then it is time to say goodbye to your relaxed ends! 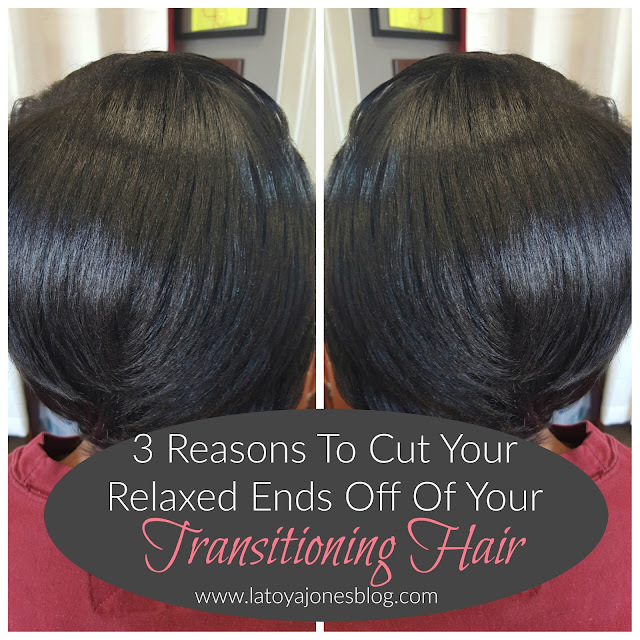 What exactly are you waiting for to cut the rest of your relaxed ends off? And remember, your relaxed hair does not "grow out" because a relaxer is permanent. Instead every time you trim it you are cutting more of the relaxed ends off which means you will see less and less of it and eventually it will be completely gone. Go ahead and do yourself a favor and get rid of the rest of those relaxed ends and go from "transitioning" to full out natural. Once I cut this client's relaxed ends off, her hair instantly looked much healthier and it even felt better. For this appointment, the products I used were all Silk Hydration by L. Jones products. I used the clarifying shampoo twice to completely remove all of the dirt, oil and residue from the hair. Once I got the hair squeaky clean I then used the replenishing conditioner and let it sit a few minutes before rinsing. Once I rinsed off I immediately felt a difference in the hair. Next, I towel dried the hair and generously applied the leave-in conditioner. Last I blow dried the hair and silk pressed it to get the result you see here. As an added touch I added just a drop of Silky Serum Oil and rubbed it all over the hair to give it a little added shine. To maintain this look at home she only needs to wrap her hair every night. As soon as she shampoos it again her natural curl will come back.